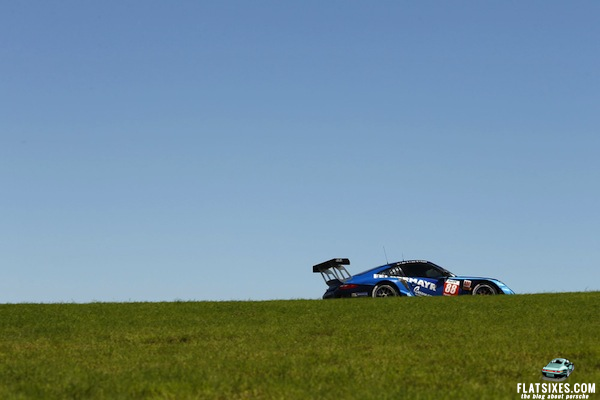 This past weekend was a special one for Porsche motorsport fans. 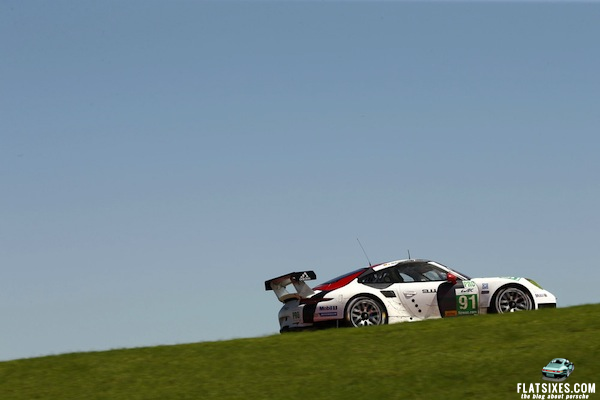 Not only was it a race filled weekend including IMSA, ALMS and WEC at the Circuit of the Americas in Austin, TX, Porsche used the race weekend as their venue to announce a two car factory supported GT team in the USCR for 2014. We were in Texas for the race and will have a full report of our time and more pictures coming soon. For now, enjoy more than 100+ pictures and a full race report from Porsche's activities in the ALMS and WEC. Remember, with out new gallery you can easily scroll through the pictures in either direction. When you're done viewing the pictures simply hit the "x" in the top left corner to return to the post. Damien Faulkner (Ireland), driving the #66 TRG Porsche 911 GT3 Cup GTC class racer, took the wheel for the final stint from starting pilot Ben Keating (Port Lavaca, Tex.) and staged an epic battle with Sean Edwards (Great Britain) before scoring TRG’s first win of the year. Edwards’ co-driver, Henrique Cisneros (Miami) led from the first lap of the race in the #30 NGT Porsche, with Edwards maintaining first place until the final part of the race. “Ben [Keating] started the car and ran a great stint, giving me a perfect car with great track position. We planned our strategy around no yellow flags, and that turned out to be the case. I caught Edwards a couple of times, but he’s a tough competitor. Fortunately, I finally got by him near the end,” said Faulkner. Keating, who scored his first-ever ALMS win, had more than 60 guests from his hometown of Port Lacava, Tex., and made the most of the week at COTA. “Our car was fast both for qualifying and the race. I thought it was great when Damien earned the pole, but winning the race was gratifying for both the drivers and the TRG team,” said Keating. Finishing third was the Dempsey Racing Porsche 911 GT3 Cup of Andy Lally (Dacula, Ga.)/Patrick Dempsey (Malibu) – the team’s second ALMS podium. The Alex Job Racing Porsche experienced mechanical issues, however drivers Cooper MacNeil (Hinsdale, Ill.)/Jeroen Bleekemolen (Monaco) maintained their first place position in the championship points chase by virtue of their sixth place finish. In the GT class, the three Porsche 911 GT3 RSR entries finished a tough day in Austin with the #17 Team Falken Tire entry driven by Wolf Henzler (Germany) and Bryan Sellers (Brasleton, Ga.) taking the checkered flag in seventh. Bryce Miller (Summit, N.J.) and Marco Holzer (Germany) drove the No. 48 Paul Miller Racing Porsche to ninth while the CORE autosport #06 was raced to tenth by Patrick Long (Playa del Rey, Calif.) and Colin Braun (Ovalo, Texas). The next round of the ALMS championship season will take place at Virginia International Raceway on October 5th. After clinching fourth place in the GTE-Pro class n the sports car World Endurance Championship WEC, Porsche works drivers Marc Lieb (Germany) and Richard Lietz (Austria) still have good chances to win the World Endurance Cup for GT drivers. They are now just three points back in the championship. In the second 911 RSR fielded by Porsche AG Team Manthey, their works driver colleagues Joerg Bergmeister (Germany) and Patrick Pilet (France) took the flag in fifth place. 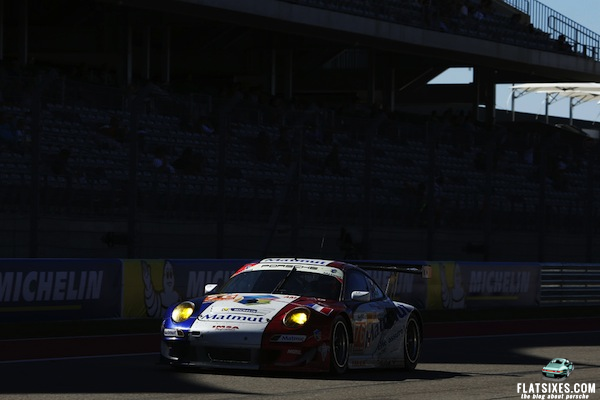 The first WEC race on the new Formula 1 circuit near the Texan capital began less than promising for Porsche. At the first pit stop with the number 91 Porsche 911 RSR, with which Joerg Bergmeister had headed into the race from the first GT grid row after a strong qualifying performance, a small amount of residual fuel that had spilled while refuelling ignited. The flames were quickly extinguished, but Patrick Pilet rejoined the race four laps down. In the 911 RSR with the starting number 92, Marc Lieb and Richard Lietz were at times on course for a podium result, but after a spirited fight had to settle for a thankless fourth place. The Porsche customer team IMSA Performance Matmut, however, scored a podium spot in the GTE-Am class: Frenchmen Jean-Karl Vernay and Raymond Narac claimed third with the 911 GT3 RSR. Fifth position went to Christian Ried (Germany) and his Italian teammates Gianluca Roda and Paolo Ruberti at the wheel of Proton Competition’s 911 from last year. Round six of the sports car World Endurance Championship WEC is held on 20 October in Fuji/Japan.